We love homemade pizza and bread! I have a Kitchenaid stand mixer and used it often, with the dough hook, to make pizza dough. But then I discovered no-knead dough, and it’s even easier! It only takes 4 ingredients, a bowl and a spoon. How much easier do you need, right? And better yet, with the same dough you can make delicious artisan bread, the kind with a thick crust and chewy center. Want to know how? Keep reading! Makes 4 1-poundloaves. This recipe is easily doubled or halved. 1. 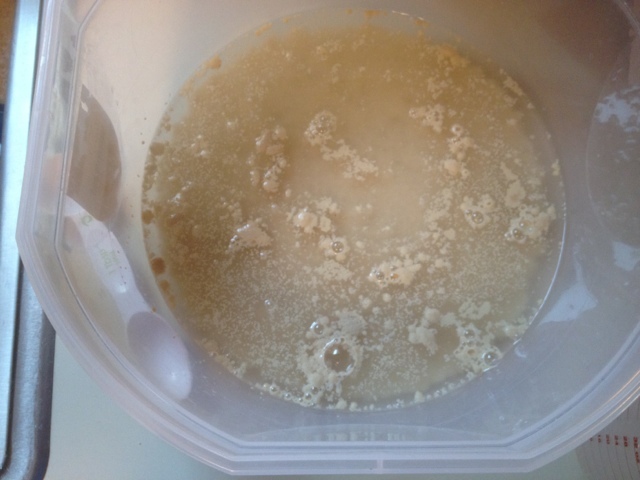 Mix the yeast and salt with the water in a 5-quart mixing bowl, or a lidded (not airtight) food container. 2. 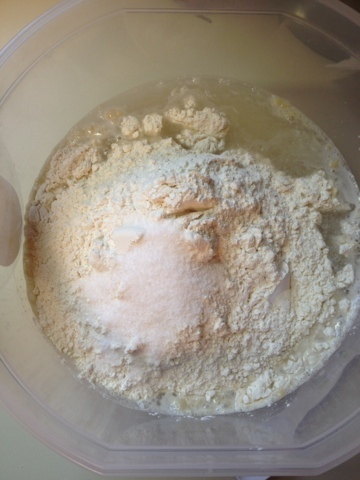 Mix in the remaining dry ingredients without kneading, using a spoon. You may need to use wet hands to incorporate the last bit of flour. 3. Cover (not airtight) and allow to rest at roomtemperature until the dough rises and collapses (or flattens on top), approximately 2 hours. 4. The dough can be used immediately after the initial rise, though it is easier to handle when cold. Refrigerate in a lidded(not airtight) container and use over the next 14 days. 1. Dust the surface of the refrigerated dough withflour and cut off a 1-pound (grapefruit sized) piece. Dust with more flour and quickly shape it into a ball by stretching the surface of the dough around to the bottom on all four sides, rotating the ball a quarter turn as you go. Allow to rest and rise on a cornmeal-covered pizza peel for 40 minutes. 2. Twenty minutes before baking time, preheat the oven to 450ºF, with a baking stone placed on the middle rack. Place an empty broiler tray (or aluminum pie plate) on any other shelf that won’t interfere with the baking bread. 3. Sprinkle the loaf liberally with flour and slash a cross, scallop, or tic-tac-toe pattern into the top, using a serrated bread knife. Leave the flour in place for baking; tap some of it off before slicing. Enjoy! Let me know how it turns out! Buon appetito! Love this recipe! Have tried it before and it is so nice to have the dough in the refrigerator ready whenever! Thanks for reminding me of this! Ciao, Bella! Oh thank you for this Sheila!!!! I have trouble with my dough rising..I am going to try this recipe!